Why You Should Sell on Amazon? If you are brand owner – why should you sell on Amazon? OR, you might be a new brand looking to gain traction as soon as possible. And now you’re thinking about expanding your channels. You’ve likely heard Amazon is a logical next step – but why? As a logical brand owner you want to understand WHY before you ever make a decision based on hype simply for hype’s sake. The “WHY” is what I’ll address in this blog post. Let’s get right into the first reason. For most brands I talk to this is a huge reason they choose to take control of their brand on Amazon. Consider this, if you already have distributor relationships chances are that one of your distributors has already gotten wise to the fact that you’re not selling directly on Amazon. They will think to themselves there’s this amazing sales channel just waiting to be taken advantage of and then add your brand up on Amazon themselves. This means they would manage the price of your brand’s products on Amazon. And who knows if they’ll stay within the MAP (minimum advertised price) agreement. And even if you do have an agreement set up are you policing Amazon to make sure they stay true to the agreement. Also, your distributors don’t have as much invested in your brand to ensure the brand quality is represented in the brand’s listing on Amazon. We’ve had brands come to us showing their listings one of their distributors put up on Amazon that is simply a single picture taken in some warehouse with poor lighting and a few bullet points of text “explaining” the product. Of course the brand owner’s are not happy about this and the way it represents their brand to the market. And in many cases the brand owner has no way of knowing which wholesale partner is listing their products on Amazon. In this situation, when someone lists your product on Amazon, they also have control over customer service interactions on Amazon too. You as the brand owner have no way to tell how they’re treating the customer and what kind of experience that customer is receiving on behalf of your brand. When you take control of your brand on Amazon you can ensure brand trust, ensure brand quality is consistent, and be sure customers are receiving the same brand experience across all your marketing channels. The second reason why you should be on Amazon is specific to those of you that own newer brands. As an agency owner I’m on calls with a lot of new brand owners who are trying to figure out the answer to the conundrum of which distribution channel to tackle first. You might have a new and innovative product or a differentiation that sets you apart but how do you get it to the masses. Typical channels like your own online store or distribution channels can take lots of time and money to get up and running profitably. One of the major benefits of new brands that we see is that Amazon offers a marketplace of buyers that are just that – primed up and ready to buy – they’re buyers. These customers are on Amazon with the express purpose of buying something. AND they are searching specific terms to find products like yours. In our experience, every time we work with brand owners that are setting up their own online store and setting up their Amazon listing(s) at the same time, Amazon outperforms their own online store every time. It’s just easier to gain traction on Amazon than just about anywhere else. This is particularly the case with products that come off Kickstarter (or other similar crowdfunding platforms) and looking for a place to duplicate their early success to the general market. Amazon fees are considerably lower than what you might experience in a traditional retail environment. And in most cases lower than what you’d experience selling on your own store. Take some numbers for example. This is a huge cost of doing business for brands selling online. If you’re selling on your own webstore (say shopify for example) the industry standard for ecommerce is to spend around 30% of revenue in ad spend. Across the accounts we manage on Amazon this number is a average of a mere 10% of revenue. Amazon has one of the largest fulfillment and warehousing networks of any company worldwide. This scale allows them to charge lower fees to fulfill the same product. Whereas warehousing companies just don’t have the scale to keep the prices as low. And will, in most cases, charge anywhere from 20-50% more to fulfil the same unit. Not to mention Amazon’s nationwide (even global network of warehouses) which significantly cuts down on shipping costs. We’ve had brand owners come to us saying that they’re shipping relationships are charging them triple what we know Amazon will charge for the same size and weight! Because they distribute your product across multiple regions and have the best rates in the world negotiated with major shipping companies to get the lowest rates. Rates you simply cannot negotiate as a single brand owner. Lastly, if you’re a traditional retailer, you already know the struggles and costs of maintaining staff and the overhead to house your inventory. Amazon all but eradicates the need for such inefficiencies. And a final consideration for owners of recognizable and strong brands. Does your brand already have a strong presence? Do consumers already know and trust your brand across the regions you sell in? Then, GOOD NEWS!, your customers are probably already looking for you on Amazon. We’ve talked to a number of well known brands that haven’t put themselves up on Amazon yet, and every time when we run the keyword search term data we find that a sizeable number of searches are coming up specific to the brand name. That’s basically cash waiting to be taken simply by putting your brand up on Amazon. Let’s not forget, if you are the owner of an already strong brand and you’re are not directly selling on Amazon then someone is likely already selling your product on Amazon. Well it could be anyone purchasing your product and turning around flipping it for a profit on Amazon. Because they see that there is demand for you product and there’s this amazing marketing channel that’s not being used by the brand owner. Essentially they’re grabbing the profits right out from under you. And they likely don’t give a care about your brand image or perception on Amazon – as long as they can move units and make a profit. So, if you take back control of your brand on Amazon you’ll be able to directly benefit from those profits and not have to worry about some 3rd party cannibalizing your listings. I might be biased but I’m just going to say it. If you’re not Amazon yet – you should be. If you have questions about your specific case please leave a comment on this post and I’ll work my best to answer for you. Now that you know WHY you should be on Amazon in the next post I’ll address how to manage the Amazon marketing channel when there are so many channels to manage. 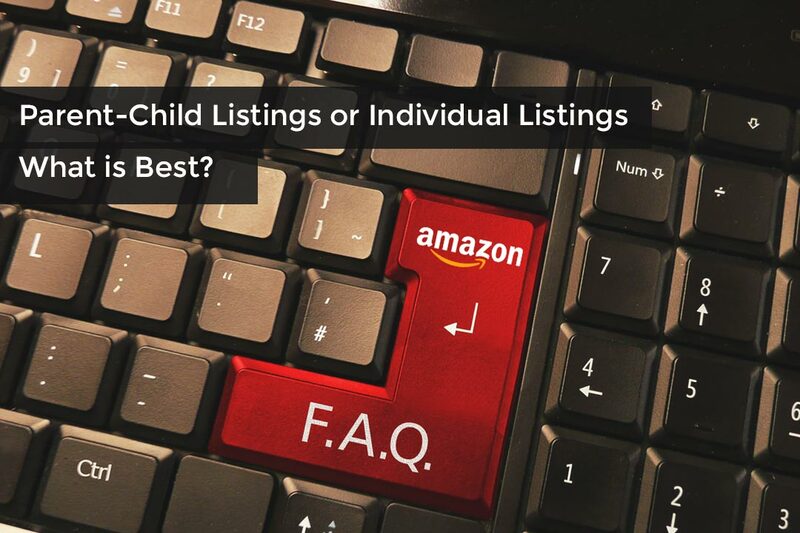 Parent-Child Listings or Individual Listings. What is Best? In Short: Parent-child listings are superior when selling on Amazon. If you sell different variations, such as sizes, flavors, colors etc. of an item, you should always add them as parent-child listings, not as separate listings.